Professor Abdulnaser Sayma leads discussion on project proposals including the Virtual Testing of gas turbine engines. 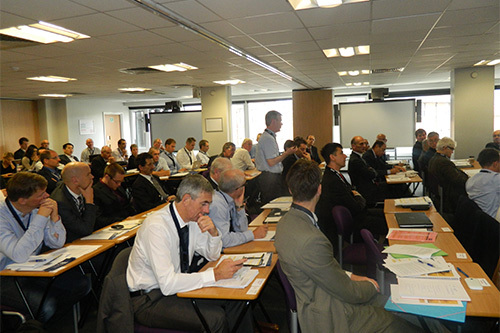 City University London successfully hosted the European Turbine Network (ETN) Workshop on the 9th and 10th October. The Workshop offered a platform for various ETN project leaders to report on the progress of their on-going projects and initiatives since the annual ETN General Meeting and Workshop held in April. The Brussels-based ETN is a non-profit association which consolidates the entire value chain of Europe's gas turbine technology community. It facilitates gas turbine research and technology development, promoting environmentally friendly, stationary gas turbine technology, with reliable and low-cost operation. 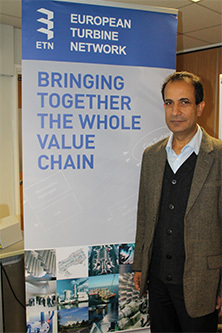 Professor Abdulnaser Sayma, Professor of Energy Engineering, is an active member of the ETN Project Board and is chairman of the ETN's Operational Flexibility Technical Committee. He says "the Workshop was successful in achieving its goal of providing an opportunity to foster collaboration between industry and research institutions to face grand challenges in the power generation sector." The ETN Operational Flexibility Technical Committee discussed a number of project proposals. A project proposal on Virtual Testing of gas turbine engines, originally proposed by City, was strongly supported by participants. "These areas, which also appeared in draft calls for the EU Horizon 2020 programme are: flexible power generation to provide back up for the expanding renewable energy and; hybridisation of concentrated solar power systems with other energy sources. It was agreed in principle that the ETN will lead efforts to form consortia to submit proposals. City will play a leading role in the preparation of a proposal in the first area and will seek to participate in the second." ETN Board president, Bernard Quoix, of French multinational integrated oil and gas company Total, gave closing remarks and thanked City for the excellent facilities and support for the event.